Handprint crafts are fun to do - and make fabulous wall art for special occasions or an extra special personalized gift. Here are some creative ideas - and my top tips for the perfect hand print. When my children were smaller I ran a small ceramics business. I would go to toddler groups or Mom coffee mornings and make decorative kids hand and footprint plates and bowls. 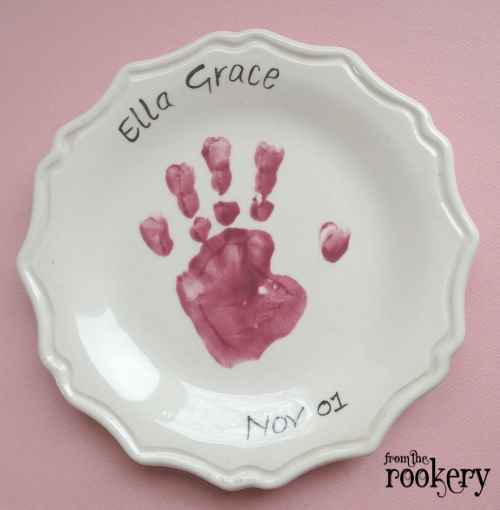 I think I must have taken thousands of handprints in my time :) Once fired these made the most wonderful gifts - and it is easy to recreate this idea yourself at home. I want to share some handprint ideas and templates with you - and help you to get the perfect print. Handprints are so fun and can be turned into lots of different creatures or shapes. If you are wanting to give the art as a gift then a simple print or two is more often more memorable and makes a keepsake that everyone will love. You can make your own (I have some poem ideas you can use further down the page) or download and print my handprint templates for just a few dollars. Want to create a memorable piece of art? All my blank templates are available for you to add your own kids handprints. 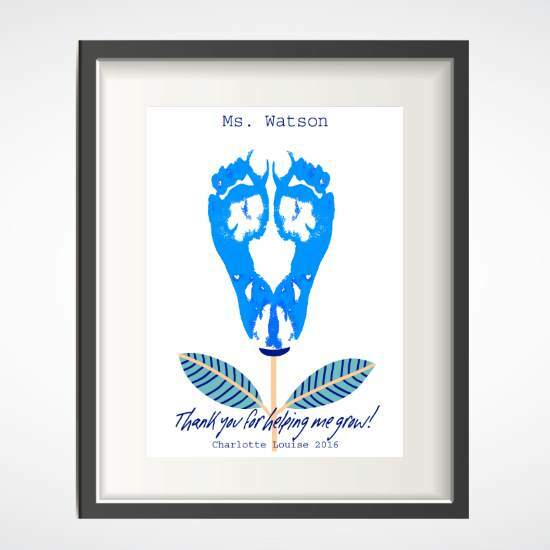 Just download and print for a truly beautiful personalized gift. Top tips for the perfect hand or footprint! There is a bit of an art to getting a great print (especially from a wiggly child or newborn!). Here are the tips that helped me get perfect results every time in my handprint business. If you are printing onto paper then use a good quality or absorbent paper. Thin photocopy paper sometimes warps when you apply paint and the hand tends to slide around. Sugar paper works well. 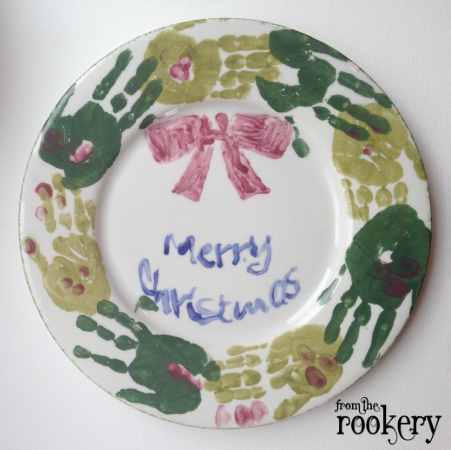 If you are using a template then print more than one copy – this way you can take a few handprints from your child and see which looks the best. Start by gathering your materials. Have baby wipes to hand, or a bowl of water and a towel. Lay down some newspaper or an old shower curtain to cover surfaces. Once you get going you may need to work quickly - especially if you have the kind of child that hates to have dirty hands. Use a non-toxic poster paint - or for ceramics see my recommendations below. Place the poster onto a flat (covered) surface. Paint your child's hand sparingly with paint. It is best not to use too much - you get a better print. You may like to make the first print onto kitchen towel to take off the excess. When you are happy, press the hand or foot onto the page, plate or poster. For babies or very young children then I recommend a footprint rather than a hand print – it is much easier to get a good result! Newborns in particular tend to keep their hands clenched making it difficult to straighten them for a print. Either get someome to hold the child while you work or put them in a high-chair. Paint their foot and then press the paper against it - I used a clipboard for posters to support the paper and keep it flat. If you have several children then place the prints around the page. I find it still looks good even if you cover the words on the template a little. Try different colored paint and see which you prefer. If your child is small and a single print looks a bit lost and lonely on the page, then do add more prints in different colors, at different angles. I sometimes print onto colored paper – then cut out the handprint and glue to the poster. It looks great to write each child's name under the print. Use a gel or metallic pen for fantastic results. You might also like to write the date at the bottom of the page to make it a real family heirloom. 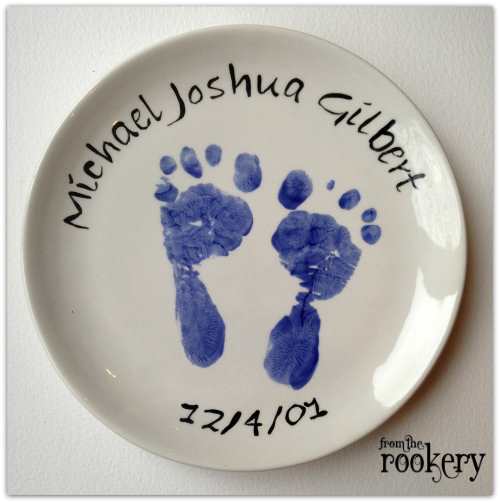 Even if you don't have access to a kiln, you can still make handprint keepsakes on ceramic plates. These will be durable and dishwasher safe - but not for use with food (they are decorative only). You can use any glazed plate (it will have a shiny glass-like surface - most shop bought potter is glazed). Choose a size that will match the size of your child's hand - or a large plate for several children. Follow the tips above to make your handprint art on the dish. You need special paints that will bake in the oven rather than poster paints (which will just wash off). I like to use Pebeo Porcelain 150 paints. These are non-toxic paints (so safe for the children to use). They come in lots of colors and in paint format or marker pen format (so you can write in names and dates). Once you have made your plate you need to let the paint dry for 24 hours. Then bake them in the oven for 35 minutes at 150°C (300°F) to 'fix' them and make the design permanent. I have also found a paint called Marabu Porcelain Ceramic Paint that requires no baking - but haven't had a chance to try this and see how well it works. If you give it a try do let me know. 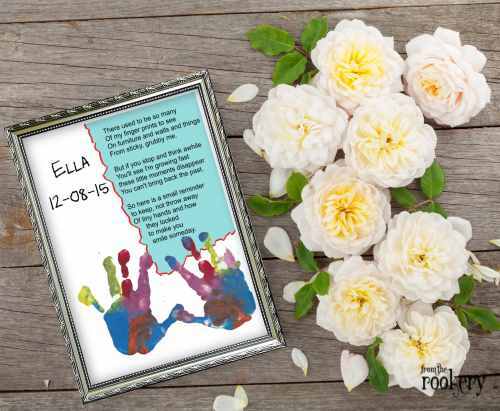 Here are some great poems or phrases that you can use to decorate your handprint art. The best (Dad/Grandma/Mom/Aunt/Teacher) in the world - hands down! Some day I will be big, and gone upon my way. But here's my little handprint to remind you of this day. This is the hand you used to hold, when I was only x years old. This is my hand. My hand will do, a 1000 loving things with you. And you will remember, When I am tall, That once my hand, Was just this small. Here is my hand, So tiny, so small, to hang somewhere, upon your wall. Children hold their mother's hand for a short time, but are in their hearts forever. Handprint crafts are a fantastic way to commemorate a special occasion. Or use to make a family tradition. 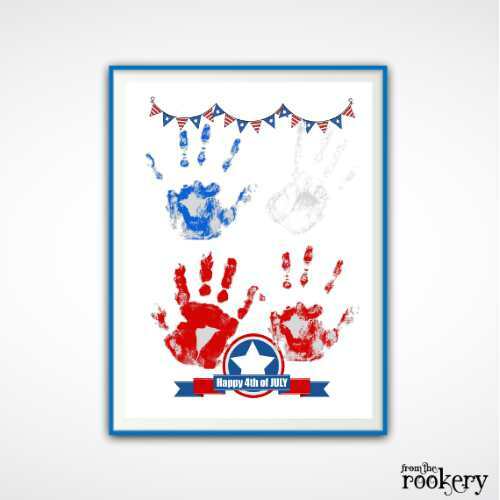 How about this fantastic 4th of July handprint memento every year as your children get older. Use red, white and blue paint for an especially patriotic theme - a light colored paper works best if you decide to use the white paint though. 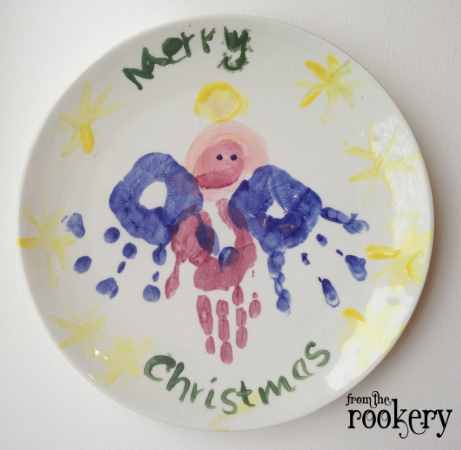 Christmas Handprint art is easy to do! It looks really effective either on plates or paper. The body of the angel is made from one handprint - then the wings from one on either side of the body. Get your child to paint in the angels head and face. If you are not using a plate, then first draw out a circle onto paper to use as a guide. I then roughly measure out the wreath circle using the child's hand - how many prints will fit around the circle and how much of an overlap will there be? The wreath in the picture is made from my son and daughters hands so we used two different greens for it. I knew I would be using four prints from each child. I started with my daughter and made a print in each quarter of the circle. Then I closed up the gaps using my sons print. Another way to do this is to make lots of prints first. Cut them out and form them into a wreath shape. Voila! Fun and easy handprint crafts that look fabulous!